"Serve these tasty tacos that get fabulous flavor from Mexican-style tomato soup. Your family can have this crunchy, and delicious dish on the table in just 20 minutes." Cook the beef in a 12-inch skillet over medium-high heat until the beef is well browned, stirring often to separate meat. Pour off any fat. Season with salt and black pepper. Stir the soup in the skillet and heat to a boil. Reduce the heat to low. Cook for 5 minutes or until the soup is reduced, stirring often. 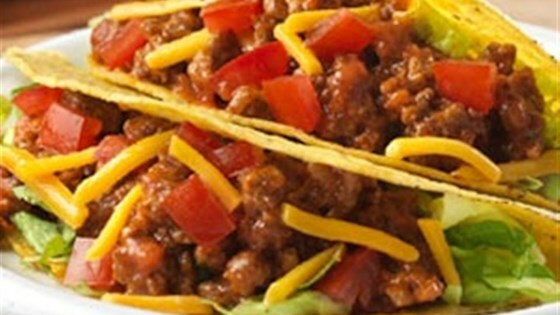 Divide the beef mixture among the taco shells. Top with the lettuce, tomato and cheese. The meat was great for tacos! Very basic but for minimal effort the flavour was good!